Epitaphs are the inscriptions on headstones. "A tomb now suffices him for whom the world was not enough"
Translation: "Nothing can separate me from the love of God". "Chief Scout of the World"
This is followed by the trail sign for "gone home" (a circle with a dot in the middle). Buried beside, and sharing a tombstone with, his brother Marvin (aka "Buck"). "I may be gone but Rock and Roll lives on"
Translation: "Though changed I shall arise the same"
Referring to the accompanying inscription of a logarithmic spiral, which remains the same after mathematical transformations. He considered it a symbol of resurrection. CLARIFICATION: Bernoulli called the logarithmic spiral Spira mirabilis, "the marvelous spiral", and wanted one engraved on his headstone. Unfortunately, an Archimedean spiral was placed there instead (picture). EPITAPH, n. An inscription on a tomb, showing that virtues acquired by death have a retroactive effect. Trademark line of cartoon character Porky Pig, whose voice was provided by Blanc for many years. "S = k log W"
The formula for entropy of a system. Boltzmann committed suicide after failing to convince contemporary scientists of the validity of the formula. Grave in the Zentralfriedhof, Vienna. "Stranger! Approach this spot with gravity! John Brown is filling his last cavity." He ask'd for bread, and he received a stone." "Jeez, he was just here a minute ago." This was his suggestion for an epitaph. In reality he was cremated and his ashes scattered. "Here lies a man who knew how to enlist the service of better men than himself." "A star on Earth--a star in Heaven"
"He could have added fortune to fame, but caring for neither, he found happiness and honor in being helpful to the world." "O friends, don't cry - it's just unused sleep." "Sleepe after toyle, port after stormie seas, ease after war, death after life doth greatly please." "Hurray, no more Council Tax". A poet lies, or that which once seem'd he. He ask'd, and hoped, through Christ. Do thou the same!" Chosen for his headstone by his wife Deborah Curtis. "Somebody's Darling Lies Buried Here"
In February 1865 a body was found at Horseshoe Bend in the Clutha River (in the South Island of New Zealand). "She did it the hard way"
And Defender of the Constitution"
"The Entertainer. He Did it All." In addition to Altovise Davis, his children-Tracey, Mark, Jeff and Manny--are also mentioned in his grave. "Shall I be gone long? Last surviving member of The Three Stooges. Look to thy purse; if female, to thy heart." We loved him a lot. But God loved him more. "Hic est Edwardvs Primus Scottorum Malleus"
Translation: "Here is Edward I, Hammer of the Scots"
"W. C. Fields 1880 - 1946"
In a 1925 article in Vanity Fair Fields had proposed the epitaph "Here lies W.C. Fields. I would rather be living in Philadelphia." because of his long-standing jokes about Philadelphia (he was actually born there), and the grave being one place he might actually not prefer to be. This is often repeated as "On the whole, I'd rather be in Philadelphia." which he might have stated at other times, and sometimes is distorted into a last dig at Philadelphia: "Better here than in Philadelphia." His actual tomb at Forest Lawn in Glendale, California simply reads as above. Corrected and improved by the Author." "I had a lover's quarrel with the world"
A trimtab is the smallest part of a rudder for a ship or airplane, and controls the direction of the craft. Pride At A Place Called "Iwo Jima"
I thought so once, and now I know it." Trademark catchphrase from his television shows. "Here rests in peace the one who was the Joy of the People – Mané Garrincha." Translated "O, lord! ", supposed last words after being shot. As he was cremated, the epitaph appears on his samadhi, a black marble platform that marks the site of his cremation. Betty Grable was married to bandleader Harry James from 1943 until 1965. She is buried at Inglewood (California) Park Cemetery, between her parents. Her father, Conn Grable, is buried below her, while her mother is buried above her crypt. "To the beautiful memory of Kenneth Grahame, husband of Elspeth and father of Alastair, who passed the River on the 6 July 1932, leaving childhood and literature through him the more blest for all time". She traverses the boundless universe." "I will not be right back after this message"
He ended the final episode of his talk show, which ended in 1986, with these words. "He gave all he possessed, including his life, for the wild animals of Africa"
"I dont regret anything, thanks"
In reference to his wild lifestyle. The PATRIOT of incorruptable INTEGRITY. He died July 12th 1804. Aged 47. Alex rests at the far south side facing Wall Street, his wife Elizabeth is next to him, his son Philip is nearby in an unmarked grave. Her husband Alexander is next to her and her son Philip is nearby in an unmarked grave. To yesterday's companionship and tomorrow's reunion"
Rita is buried at Holy Cross Cemetery in Culver City, California. Rebecca Welles is the daughter of Hayworth from her marriage to Orson Welles. To me Diverse realms were subject, I was duke and count of many provinces. For whom the Earth was not enough." This is a joke about the famous Heisenberg Uncertainty Principle, which implies that one may not know the position and momentum of a particle simultaneously. Therefore not mentioned on this stone." (Grave at St Peter's, Isle of Thanet, Kent). Who was neither ingenious, sober, nor kind." "Here lies all that could die of William Stephen Raikes Hodson." "God give me work while I may live, and life till my work is done." Vil england nivr si agen." Lies Robert, Earl of Huntingdon. A poem in Proto-Nostratic language, probably spoken several millennia ago, which was reconstructed by Illich-Svitych.
" Murdered by a traitor and a coward whose name is not worthy to appear here"
and father of the University of Virginia"
Despite his being the 2nd Vice-President and 3rd President of the US, these are not mentioned. He had said that he wanted to be remembered for what he gave to the US, and not what the US had given to him.
" I told you I was sick." " Hold my drink, you're gonna' love this." Translation: "Invoked or not invoked, God will be present." Translation: "I hope for nothing. I fear nothing. I am free." "This Grave contains all that was mortal, of a Young English Poet, who on his Death Bed, in the Bitterness of his heart, at the Malicious Power of his enemies, desired these words to be Engraven on his Tomb Stone: Here lies One Whose Name was writ in Water." Keats desired only the phrase "Here lies one whose name was writ in water" to be on his tombstone. However his friends, Joseph Severn and Charles Brown, added the rest. "K-eats! if thy cherished name be "writ in water"
S-leep on! Not honoured less for Epitaph so meek!" Written on a small plaque, on the cemetery wall nearby. "Free at last. Free at last. Thank God Almighty I'm Free At Last." Lyrics of an old African American Spiritual he frequently quoted. "Nothing in Moderation. We all loved him." Kovacs, Adams and their daughter, Mia Susan, are interred at Forest Lawn Memorial Park in Los Angeles. Their epitaphs are variations of the second sentence as above; Mia Susan's epitaph reads, "Daddy's girl. We all loved her too." Ever Joined in True Love's Beauty." It was his number in Auschwitz. dwell in the uttermost parts of the sea"
Nearby the following appears: "Stop Traveller! Near this place lieth John Locke. If you ask what kind of a man he was, he answers that he lived content with his own small fortune. Bred a scholar, he made his learning subservient only to the cause of truth. This thou will learn from his writings, which will show thee everything else concerning him, with greater truth, than the suspect praises of an epitaph. His virtues, indeed, if he had any, were too little for him to propose as matter of praise to himself, or as an example to thee. Let his vices be buried together. As to an example of manners, if you seek that, you have it in the Gospels; of vices, to wish you have one nowhere; if mortality, certainly, (and may it profit thee), thou hast one here and everywhere." (translated from the original Latin). "The Stone the Builders Rejected"
At the time of Rob Roy's fame, the MacGregor name became banned and was never allowed to be heard or seen by law. The epitaph phrase in full, "Rob Roy MacGregor, despite them" is a last standing testament to defy that law. 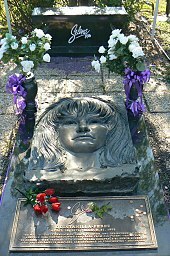 "We live to love you more each day"
Appears at her headstone at the Pen Argyl (Pennsylvania) Cemetery and at her cenotaph at Hollywood Forever Cemetery in Los Angeles. "I may not have been the greatest Yankee to put on the uniform, but I was always the proudest"
Title of one of his songs. In an interview, he jokingly suggested his epitaph read "Excuse me, I can't stand up. ", but his mausoleum marker bears only his stage name and years of birth and death. "When I was in the military, they gave me a medal for killing two men and a discharge for loving one." Mr. McCaffery is buried in Montreal. The epitaph is an acrostic poem, in that the first letters of each line spell out, "F-U-C-K Y-O-U" The motive of his "'friends'" is unknown. However, the Montreal Mirror quoted the gravestone's engraver as saying that the stone was ordered by McCaffery's "ex-wife and mistress... They said the message represented him. It was a thing between the three of them." "If after I depart this vale you ever remember me and have thought to please my ghost, forgive some sinner, and wink your eye at some homely girl"
Dúirt mé leat go raibh mé breoite. Translation from Irish: "I told you I was ill."
On Grave stone in Idaho State Penitentiary, Lester Moore died while attempting escape. Lester Moore is the only Inmate buried on the grounds of the Idaho State Pen. Translation from Greek: "Truth to your own spirit" His body is buried in Paris's famous Père LaChaise cemetery in the company of many other celebrities. Next to him in the "Poet's Corner" are buried many celebrated writers, including Balzac, Molière, Oscar Wilde and Frédéric Chopin. But now he's only dirt." On his tombstone, "Hic depositum est, quod mortale fuit Isaaci Newtoni," which is translatable as "here is deposited what was mortal of Isaac Newton"
"There is but no life without Death"
"Never Born // Never Died // Only Visited this Planet Earth between // Dec 11 1931 – Jan 19 1990". As quoted in Laughing Gods, Weeping Virgins : Laughter in the History of Religion (1997) by Ingvild Sælid Gilhus, p. 143. "It distresses us to return work which is not perfect." Written when O'Toole was still alive, possibly a planned epitaph. O'Tool's wife sent an old and much stained leather jacket to the cleaners and they returned it, having done their best, with a note pinned to the lapel which read, "It distresses us to ect..." This amused O'tool so much he declared it would be on his "tomb stone". Reportedly taken from one of Bonnie's poems. "Here lie the ashes of Dorothy Parker (1893 - 1967) Humorist, Writer, Critic, Defender of human and civil rights. For her epitaph, she suggested "Excuse My Dust". This memorial garden is dedicated to her noble spirit which celebrated the oneness of humankind and to the bonds of everlasting friendship between Black and Jewish people. Dedicated by The National Association of the Advancement of Colored People, October 20, 1988." (On a memorial plaque). "Mother of the Civil Rights Movement"
Parks is remembered for her involvement in the Montgomery, Alabama, bus boycott, which began the Civil Rights movement. In her last decades she lived in Detroit, Michigan; she is buried as Oakwood Cemetery in that city. "Is this your card?" and a graphic of a card of the 3 of clubs. From the Book "Penn and Teller's How to play in traffic" ISBN 1572972939 - Penn and Teller bought a cenotaph (an epitaph without a grave beneath it) and placed it in Forest Lawn Cemetery in Hollywood. They invite people touring there to use it to surprise their friends as a punchline for a card trick. "Fui o que não sou"
Translation: "I was what I am not." His was the highest place." "A friend to honesty and a foe to crime"
"Even amidst fierce flames the golden lotus can be planted." From his poem "The Raven". This inscription appears on his original grave marker. The current marker, in the same cemetery, bears just his name. "Här under är askan av en man som hade vanan att skjuta allt till morgondagen. Dock bättrades han på sitt yttersta och dog verkligen den 31 januari 1972." Roughly translated: "Here lie the ashes of a man who had the habit of postponing everything until tomorrow. However, at the end of his life he improved, and actually died on the 31st of January 1972." "We Love You. Psalm 23"
"At this spot the 77th Infantry Division lost a buddy, Ernie Pyle, 18 April 1945. He had the 2nd fastest draw. Only bettered by Slow Draw Shaw. Spanish: "Gracias por tu magia, que me hizo tanto reír con tu sencillez, con tu gorrito desteñido, tu bondad, tu valor, por ser el papi más padre, por enseñarnos, por tus berrinches, por tu talento. No habrás pagado la renta en dinero pero la pagaste con el mejor tesoro del mundo, la risa. Un ángel en el cielo. English translation; "Thank you for your magic, which made me laugh so much with your simplicity, with your faded hat, your kindness, your courage, for being the most awesome daddy, for teaching us, for your tantrums, for your talent. You will not had paid the rent in money but you paid it with the best treasure in the world, laughter. An angel in the sky. "O.K. … I gotta go now." "If a man can tell he's been successful in his life by having great friends, then I have been very successful." as far as fear is concerned"
(carved into a boulder) "This is on me." English; "He will actually swallow up death forever, and the sovereign lord Jehovah will certainly wipe the tears from all faces"
Spanish: "El realmente se tragará a la muerte para siempre, y el señor soberano Jehová ciertamente limpiara las lagrimas de todo rostro. And time demands its toll." To digg the dvst encloasèd heare. And cvrst be he yt moves my bones." And cursed be he that moves my bones." "It ain't Sam unless its me"
Title of one of his trademark songs. From the Three Stooges short "Brideless Groom"
If the car was on the way down. "Ω ΞΕΙΝ ΑΓΓΕΛΛΕΙΝ ΛΑΚΕΔΑΙΜΟΝΙΟΙΣ ΟΤΙ ΤΗΔΕ ΚΕΙΜΕΘΑ ΤΟΙΣ ΚΕΙΝΩΝ ΡΗΜΑΣΙ ΠΕΙΘΟΜΕΝΟΙ"
Translation: "Go Tell the Spartans, Stranger passing by, that here, obedient to their laws, we lie." This epitaph also prefaces the Robert Heinlein story "Requiem" and serves as the protagonist's epitaph; use for Stevenson reported in Hoyt's New Cyclopedia Of Practical Quotations (1922), p. 235.
make sure you bring good memories. and where you are is where they're made." This epitaph, from the lyrics to Gilbert & Sullivan's "Yeoman of the Guard", is on the monument to Sullivan in Victoria Embankment Gardens, not on his grave in St Paul's Cathedral. "No friend ever served me, and no enemy ever wronged me, whom I have not repaid in full." This poem ("Crossing the Bar") is included at the end of every collection of his works. "Curiosity did not kill this cat." a Grenadier in the North Reg. testimony of their regard and concern. by the Officers of the Garrison A.D. 1781.
whether he die by Musket or by Pot. the original Stone being destroyed. The Royal Hampshire Regiment 1966. J.R.R.Tolkien and his wife's tomb. Beren was a famous human hero during the First Age of Tolkien's fictional world Middle-earth. Beren's love was the immortal Elven maid Lúthien who chose the fate of mortality to be able to follow Beren after he died. The name "Lúthien" is inscribed underneath the name Edith Tolkien on the pair's headstone. "THE ONLY PROOF HE NEEDED FOR THE EXISTENCE OF GOD WAS MUSIC"
Hic situs est Rufus, pulso qui Vindice quondam imperium asseruit non sibi sed patriae. "Here lies Rufus, who after defeating Vindex, did not take power, but gave it to the fatherland"
From: Plinius Secundus Minor, Epistulae, liber VI, 10. Then all prejudice of race vanishes away." "I told you so, you damned fools." From The Ballad of Reading Gaol. "Nobody's perfect" is the final line of the movie "Some Like It Hot." They will live long, and longer"
"Lector, si monumentum requiris circumspice." Translation: "Reader, if you seek his monument, look around." Wren is buried in St Paul's Cathedral, London, which he designed. unvanquished and unyielding, O Death!" "Il dort. Quoique le sort fût pour lui bien étrange,; Il vivait. Il mourut quand il n’eut plus son ange,; La chose simplement d’elle-même arriva,; Comme la nuit se fait lorsque le jour s’en va."
He sleeps. Although his fate was very strange, he lived. He died when he had no longer his angel. The thing came to pass simply, of itself, as the night comes when day is gone. Note: He was murdered by his son, and the kingdom of Lordaeron fell. "Here lies Edmund Blackadder, and he's bloody annoyed." Courage and faith; vain faith, and courage vain. And one dear hope, that was more prized than they. The resting-place I ask'd, an early grave. O'er English dust. A broken heart lies here." Dentist Mark B is filling his last cavity." Lie lightly on my ashes, gentle earthe. John Fletcher, Bonduca (1611–14; published 1647), Act IV, scene 3. ("Sit tibi terra levis," familiar inscription). Translation: "Fortune favours the brave"
"Bugger this. I want a better world." "Here lies David St. Hubbins...and why not?" From "This is Spinal Tap". Suggested when asked what he'd want as his epitaph. Buffy the Vampire Slayer, "The Gift"
"Blimey it's darker than I thought in here." "No man can hold his breath for ten minutes." "You're standing on my head." "Rover was a true friend and pet, but ran in thunderstorms when wet." "Not dead only sleeping, buried me anyway. Unlucky." "I finished before you in the human race." "Anyone want to swap places?" "Thank you for reading this grave now bugger off!" Dame Fortune inspired him to eminence, damn her! Fictional future senator used as one of five examples under "Epitaph", from The Devil's Dictionary. In reference to painter Jan Vermeer; from the film Girl with a Pearl Earring. From Harry Potter and the Deathly Hallows, quote from the Bible; Matthew 6:21. "The last enemy that shall be defeated is death"
From Harry Potter and the Deathly Hallows, quote from the Bible: 1 Corinthians 15:26. "In memory of a patriot who saved the world. 192X-1964"
From Metal Gear Solid 3: Snake Eater, in the game's final scene. "A hero, forever loyal to the flames of war, rests in Outer Heaven. 193X - 1999"
From Metal Gear Solid 4: Guns of the Patriots. PS: Big Boss grave is located next to The Boss's one. "He had six bullets but he needed seven." And trust the world we won for you to keep." Do escuro vieram, nas trevas viveram e para o além se foram. Translation: From the dark they've come, among obscurity they've lived and to the hereafter they've gone. "Quello che siete fummo, quello che siamo sarete"
Translation: "What you are we were and what we are you will become"
Who are so wondrous sweet and fair"
From Waller's poem "Go, Lovely Rose"
I wonder what I was begun for?" And cost us forty dollars." Which we have paid and so must you." Bow your head and pray for me." "Nós ossos que aqui estamos pelos vossos esperamos" - "We, bones that here lie, for yours we wait"
I was well at night and dead at nine in the morning"
"je ne me souviens pas - or, here lies one whose name was writ in air"
Tomb of the Unknowns, Arlington National Cemetery, Arlington, Virginia; also used in other American War cemeteries, such as the ones in Normandy. the Freedom of the world. We do not know this Australian's name and we never will. We do not know his rank or battalion. We do not know where he was born, nor precisely how he died … We will never know who this Australian was … he was one of the 45,000 Australians who died on the Western Front … one of the 60,000 Australians who died on foreign soil. One of the 100,000 Australians who died in wars this century. He is all of them. And he is one of us. "Sparta hath many a worthier son than he." Lord Byron, Childe Harold's Pilgrimage, Canto IV (1818), Stanza 10. Lord Byron, The Giaour (1813), line 106. After your death you were better have a bad epitaph than their ill report while you live. William Shakespeare, Hamlet (1600-02), Act II, scene 2, line 548. William Shakespeare, Henry V (c. 1599), Act I, scene 2, line 230. William Shakespeare, The Merchant of Venice (late 1590s), Act IV, scene 1, line 117. William Shakespeare, Much Ado About Nothing (1598-99), Act IV, scene 1, line 208. And sing it to her bones, sing it to-night. William Shakespeare, Much Ado About Nothing (1598-99), Act V, scene 1. I,. 291. Let's talk of graves, of worms and epitaphs. William Shakespeare, Richard II (c. 1595), Act III, scene 2, line 144. Quotes reported in Hoyt's New Cyclopedia Of Practical Quotations (1922), p. 229-35. Here lies the remains of James Pady, Brickmaker, in hope that his clay will be remoulded in a workmanlike manner, far superior to his former perishable materials. Epitaph from Addiscombe Church-yard, Devonshire; reported in Hoyt's New Cyclopedia Of Practical Quotations (1922), p. 229. Stavo bene; per star meglio, sto qui. I was well, I would be better; I am here. Addison's translation of the epitaph on the monument of an Italian Valetudinarian. Spectator. No. 25. Boswell's Life of Johnson (April 7, 1775); reported in Hoyt's New Cyclopedia Of Practical Quotations (1922), p. 229. Sufficit huic tumulus, cui non suffecerit orbis. Epitaph on Alexander the Great; reported in Hoyt's New Cyclopedia Of Practical Quotations (1922), p. 229. My refuge!" and no more. Matthew Arnold, Epitaph; reported in Hoyt's New Cyclopedia Of Practical Quotations (1922), p. 229. Here lies who, born a man, a grocer died. Translation of a French epitaph: Né homme—mort épicier. Alfred Austin, Golden Age; reported in Hoyt's New Cyclopedia Of Practical Quotations (1922), p. 229. Old maid and died an old Mann. Bath Abbey; reported in Hoyt's New Cyclopedia Of Practical Quotations (1922), p. 229. Though the weapon of the Lord was in his hand:"
"He was wretched ev'n as we;"
And thy tomb may be unhonoured in the land. Robert Buchanan, The Modern Warrior, Stanza 7; reported in Hoyt's New Cyclopedia Of Practical Quotations (1922), p. 229. Here HAROLD lies—but where's his Epitaph? Ten thousand, just as fit for him as you. Lord Byron, Substitute for an Epitaph; reported in Hoyt's New Cyclopedia Of Practical Quotations (1922), p. 229. Free from erratas, new in heaven set forth. Joseph Capen, lines upon Mr. John Foster. Borrowed from Rev. B. Woodbridge; reported in Hoyt's New Cyclopedia Of Practical Quotations (1922), p. 229. So fine that it the guest betray'd. Thomas Carew, inscription on tomb of Lady Maria Wentworth. In Toddington Church, Bedfordshire, England; reported in Hoyt's New Cyclopedia Of Practical Quotations (1922), p. 229. This Mirabeau's work, then, is done. He sleeps with the primeval giants. He has gone over to the majority: "Abiit ad plures." Thomas Carlyle, Essay on Mirabeau, Close; reported in Hoyt's New Cyclopedia Of Practical Quotations (1922), p. 229. I wonder what I was begun for! Epitaph in Cheltenham Church-yard; reported in Hoyt's New Cyclopedia Of Practical Quotations (1922), p. 229. Samuel Taylor Coleridge, Epitaph on an Infant; reported in Hoyt's New Cyclopedia Of Practical Quotations (1922), p. 229. Epitaph on a Cook (London); reported in Hoyt's New Cyclopedia Of Practical Quotations (1922), p. 229. And the lucrative trade of the oven. In hopes that her crust may be raised. Epitaph on a Cook (Yorkshire); reported in Hoyt's New Cyclopedia Of Practical Quotations (1922), p. 229. What wee left, wee lost. Epitaph on Edward Courtenay, Earl of Devon. (1419). In Cleveland's Geneal. Hist. of the Family of Courtenay, p. 142. Said to be on a tomb in Padua. Attributed to Carlyle; not found. Like inscriptions are found on many old tombstones. The oldest is probably the one in the choir of St. Peter's Church at St. Albans; reported in Hoyt's New Cyclopedia Of Practical Quotations (1922), p. 229-230. And honoured, by the muse he loved. Lines from the epitaph of James Craggs in Westminster Abbey; reported in Hoyt's New Cyclopedia Of Practical Quotations (1922), p. 230. "Only, She did her best." Dinah Craik (Miss Mulock). Given in her obituary notice in the Athenæum (Oct. 22, 1887); reported in Hoyt's New Cyclopedia Of Practical Quotations (1922), p. 230. O man! whosoever thou art, and whensoever thou comest, for come I know thou wilt, I am Cyrus, founder of the Persian empire. Envy me not the little earth that covers my body. Plutarch, Life of Alexander, Epitaph of Cyrus; reported in Hoyt's New Cyclopedia Of Practical Quotations (1922), p. 230. And Cared Not How It Blew. Epitaph in Deal Churchyard; reported in Hoyt's New Cyclopedia Of Practical Quotations (1922), p. 230. Charles Dibdin, Tom Bowling. Written on the death of his brother. Inscribed on Charles Dibdin's gravestone, in the cemetery of St. Martin's-in-the-Fields, Camden Town; reported in Hoyt's New Cyclopedia Of Practical Quotations (1922), p. 230. His soul has gone aloft. Charles Dibdin, Tom Bowling. Written on the death of his brother; reported in Hoyt's New Cyclopedia Of Practical Quotations (1922), p. 230. This comes of altering fundamental laws and overpersuading by his landlord to take physic (of which he died) for the benefit of the doctor—Stavo bene (was written on his monument) ma per star meglio, sto qui. John Dryden, Dedication of the Æneid (29-19 BC), XIV. 149; reported in Hoyt's New Cyclopedia Of Practical Quotations (1922), p. 230. Claude Du Vall's Epitaph in Covent Garden Church. Found in Francis Watt's Law's Slumber Room. 2nd Series; reported in Hoyt's New Cyclopedia Of Practical Quotations (1922), p. 230. The bosom of her Lord. Ebenezer Elliot, Hannah Ratcliff; reported in Hoyt's New Cyclopedia Of Practical Quotations (1922), p. 230. "Let there be no inscription upon my tomb. Let no man write my epitaph. No man can write my epitaph. I am here ready to die. I am not allowed to vindicate my character; and when I am prevented from vindicating myself, let no man dare calumniate me. Let my character and motives repose in obscurity and peace, till other times and other men can do them justice." Robert Emmet, speech on his trial and conviction for high treason (September, 1803); reported in Hoyt's New Cyclopedia Of Practical Quotations (1922), p. 230. Nemo me lacrumis decoret neque funera fletu faxit. Let no one pay me honor with tears, nor make for me a weeping funeral. Laid many heavy loads on thee. Dr. Abel Evans, epitaph on the architect of Blenheim Palace. (Vanbrugh is buried in St. Stephen's Church, Walbrook, England); reported in Hoyt's New Cyclopedia Of Practical Quotations (1922), p. 230. Laid many a heavy load on thee. As quoted by Snuffling—Epitaphia; Architects. Box, Elegies and Epitaphs. Voltaire, Letters (1733), p. 187; reported in Hoyt's New Cyclopedia Of Practical Quotations (1922), p. 230. The body of Benjamin Franklin, Printer, (Like the cover of an old book, its contents torn out and stript of its lettering and gilding), Lies here, food for worms; But the work shall not be lost, for it will (as he believed) appear once more in a new and more elegant edition, revised and corrected by the author. Benjamin Franklin, Epitaph on Himself. Written in 1728. Revised by himself from an earlier one. John Davis, in Travels of Four Years and a Half in the United States of America, gives similar epitaph in Latin, said to have been written by "An Eton scholar"; reported in Hoyt's New Cyclopedia Of Practical Quotations (1922), p. 230. Quand je serai la, je serai sans souci. When I shall be there, I shall be without care. Frederick the Great. His inscription written at the foot of the statue of Flora at Sans Souci, where he wished to be buried. His body lies in the church at Potsdam; reported in Hoyt's New Cyclopedia Of Practical Quotations (1922), p. 230.
Who was alive and is dead. No one would have missed her. Still better for the nation. Epitaph to Frederick, Prince of Wales (Father of George III), as given by Thackeray—Four Georges. Probably version of a French epigram "Colas est morte de maladie," found in Les Epigrammes de Jean Ogier Gombauld. (1658). Several early versions of same. See Notes and Queries. May 3, 1902, p. 345; reported in Hoyt's New Cyclopedia Of Practical Quotations (1922), p. 230. Thomas Fuller, Epitaph written by Himself; reported in Hoyt's New Cyclopedia Of Practical Quotations (1922), p. 230.
Who wrote like an angel, and talked like poor Poll. David Garrick; reported in Hoyt's New Cyclopedia Of Practical Quotations (1922), p. 231. The little David and the great Goliath. Note in Thespian Dictionary appended to account of Garrick, whose remains lie close to those of Johnson, in Westminster Abbey; reported in Hoyt's New Cyclopedia Of Practical Quotations (1922), p. 231. John Gay, My Own Epitaph; reported in Hoyt's New Cyclopedia Of Practical Quotations (1922), p. 231. Like a worn out type, he is returned to the Founder in the hope of being recast in a better and more perfect mould. Epitaph on Peter Gedge; Parish church, St. Mary, Bury St. Edmund's; reported in Hoyt's New Cyclopedia Of Practical Quotations (1922), p. 231. I am punished. What I formerly expended, I have; what I gave away, I have. Gesta Romanorum, Tale XVI; Found on the golden sarcophagus of a Roman Emperor; reported in Hoyt's New Cyclopedia Of Practical Quotations (1922), p. 231. What more of a man can be said? Oliver Goldsmith, Punning epitaph on John Newbery, the publisher; reported in Hoyt's New Cyclopedia Of Practical Quotations (1922), p. 231. Qui nullum fere scribendi genus non tetigit; nullum quod tetigit non ornavit. Who left nothing of authorship untouched, and touched nothing which he did not adorn. Goldsmith's Epitaph in Westminster Abbey; Written by Samuel Johnson; reported in Hoyt's New Cyclopedia Of Practical Quotations (1922), p. 231. Thomas Gray, Elegy in a Country Churchyard, Stanza 21; reported in Hoyt's New Cyclopedia Of Practical Quotations (1922), p. 231. Sed vitam faciunt baldea, vina, Venus. Baths, wine and Venus bring decay to our bodies; but baths, wine and Venus make up life. Epitaph in Gruter's Monumenta; reported in Hoyt's New Cyclopedia Of Practical Quotations (1922), p. 231. And Isaac Greentree rise above them all. Epitaph at Harrow; reported in Hoyt's New Cyclopedia Of Practical Quotations (1922), p. 231. Anthony Hope Hawkins, Inscribed on the bronze tablet placed in memory of Sir William Gilbert on the Victoria Embankment (Aug. 31, 1915); reported in Hoyt's New Cyclopedia Of Practical Quotations (1922), p. 231. Bronze is by Sir George Frampton. My days are past, my head lies quiet here. Look but at home, enough is to be done. Epitaph over William Harvey in Greasley Churchyard, England (1756); reported in Hoyt's New Cyclopedia Of Practical Quotations (1922), p. 231. A travesty of the same is over the tomb of Phillis Robinson, in that churchyard (1866). See Alfred Stapleton, The Churchyard Scribe, p. 95. As we are now so must you be. Joseph Henshaw, Horæ Succisivæ; reported in Hoyt's New Cyclopedia Of Practical Quotations (1922), p. 231. But here's the sunset of a tedious day. And so to bed. Pray wish us all good rest. Robert Herrick, Epitaph on Sir Edward Giles; reported in Hoyt's New Cyclopedia Of Practical Quotations (1922), p. 231. Robert Herrick, Upon a Child that Dyed; reported in Hoyt's New Cyclopedia Of Practical Quotations (1922), p. 231. In golden letters—"WHILE SHE LIVED SHE SHONE." Jean Ingelow, Star's Monument, Stanza 47; reported in Hoyt's New Cyclopedia Of Practical Quotations (1922), p. 231. Samuel Johnson, Epitaph for Hogarth; reported in Hoyt's New Cyclopedia Of Practical Quotations (1922), p. 231. Till angels wake thee with a note like thine. Samuel Johnson, Epitaph on Claude Phillips; reported in Hoyt's New Cyclopedia Of Practical Quotations (1922), p. 231. Ben Jonson, Epigram CXXIV, To Lady Elizabeth L. H.; reported in Hoyt's New Cyclopedia Of Practical Quotations (1922), p. 231. Tyme shall throw a dart at thee. Attributed to Ben Jonson, Epitaph on the Countess of Pembroke; reported in Hoyt's New Cyclopedia Of Practical Quotations (1922), p. 231-232. Claimed for Sir Thomas Browne by Sir Egerton Brydges. It is in Lansdowne Manuscript No. 777, in British Museum. Poems by Browne, Volume II, p. 342. Ed. by W. C. Hazlitt for the Roxburghe Library. Engraved on Keats' tombstone at his own desire; reported in Hoyt's New Cyclopedia Of Practical Quotations (1922), p. 232. Phrase "writ in water" in Hakewell's Apologie (1635), p. 127. William Shakespeare, King Henry VIII, Act IV, scene II. I conceive disgust at these impertinent and misbecoming familiarities inscribed upon your ordinary tombstone. Charles Lamb; reported in Hoyt's New Cyclopedia Of Practical Quotations (1922), p. 232. Walter Savage Landor, Epitaph on Himself; reported in Hoyt's New Cyclopedia Of Practical Quotations (1922), p. 232. Dead he is not, but departed,—for the artist never dies. Henry Wadsworth Longfellow, Nuremberg; reported in Hoyt's New Cyclopedia Of Practical Quotations (1922), p. 232. George McDonald, David Elginbrod, Chapter XIII; reported in Hoyt's New Cyclopedia Of Practical Quotations (1922), p. 232. The shameless Chloe placed on the tombs of her seven husbands the inscription, "The work of Chloe." How could she have expressed herself more plainly? Martial, Epigrams (c. 80-104 AD), Book IX, Epigram 15; reported in Hoyt's New Cyclopedia Of Practical Quotations (1922), p. 232. This work, newly revised and improved by its great Author, will reappear in a splendid day. Epitaph on Oscar Meader in a church in Berlin. Here lies the child spoiled by the world which he spoiled. Baronne de Montolieu, Epitaph on Voltaire; reported in Hoyt's New Cyclopedia Of Practical Quotations (1922), p. 232. Order of the Mass; reported in Hoyt's New Cyclopedia Of Practical Quotations (1922), p. 232. On the monument of Abraham Newland, principal cashier of the Bank of England (Died, 1807; his own lines); reported in Hoyt's New Cyclopedia Of Practical Quotations (1922), p. 232. Vix manet e toto parva quod urna capit. Here lies Tibullus; of all that he was there scarcely remains enough to fill a small urn. Ovid, Amorum (16 BC), Book III, 9, 39; reported in Hoyt's New Cyclopedia Of Practical Quotations (1922), p. 232. May his bones rest gently. Ovid, Heroides, VII, 162; reported in Hoyt's New Cyclopedia Of Practical Quotations (1922), p. 232. Thomas Love Peacock, To Sir Peter; reported in Hoyt's New Cyclopedia Of Practical Quotations (1922), p. 232. Et numeri innumeri simul omnes collacrumarunt. Plautus has prepared himself for a life beyond the grave; the comic stage deserted weeps; laughter also and jest and joke; and poetic and prosaic will bewail his loss together. Epitaph of Plautus, by himself; reported in Hoyt's New Cyclopedia Of Practical Quotations (1922), p. 232. Trusts in God that as well as he was he shall be. Alexander Pope, Epitaph; reported in Hoyt's New Cyclopedia Of Practical Quotations (1922), p. 232. Her works; and dying, fears herself may die. Alexander Pope, Inscription on the monument of Sir Geofrey Kneller in Westminster Abbey; reported in Hoyt's New Cyclopedia Of Practical Quotations (1922), p. 232. Imitated from the epitaph on Raphael, in the Pantheon at Rome. To this sad shrine, whoe'er thou art! draw near! Alexander Pope, Epitaph on Harcourt; reported in Hoyt's New Cyclopedia Of Practical Quotations (1922), p. 232. Nihil unquam peccavit, nisi quod mortua est. She never did wrong in any way, unless in the fact that she died. On a wife's tomb at Rome; reported in Hoyt's New Cyclopedia Of Practical Quotations (1922), p. 232. Thank'd Heaven that he had lived, and that he died. Alexander Pope, Epitaph X; reported in Hoyt's New Cyclopedia Of Practical Quotations (1922), p. 232. And praised, unenvied, by the muse he loved. Alexander Pope, Moral Essays, Epistle V, line 67 (to Addison); reported in Hoyt's New Cyclopedia Of Practical Quotations (1922), p. 233. Can Bourbon or Nassau go higher? Matthew Prior, Epitaph, Extempore (as given in original edition); reported in Hoyt's New Cyclopedia Of Practical Quotations (1922), p. 233. I'se willing give him leve. Epitaph in an old Scottish Churchyard; reported in Hoyt's New Cyclopedia Of Practical Quotations (1922), p. 233. Mine haven's found; Fortune and Hope, adieu. Inscription on the tomb of Francesco Pucci in the church of St. Onuphrius, (St. Onofrio), Rome; reported in Hoyt's New Cyclopedia Of Practical Quotations (1922), p. 233. Translation by Burton, Anatomy of Melancholy, Part II, Section III. Memb. 6. Quoted by him as a saying of Prudentius. Attributed to Janus Pannonius. See Jani Panuonii, Onofrio, Part II. Folio 70. Found in Laurentius Schradern's Monumenta Italiæ, Folio Helmæstadii, p. 164. Attributed to Cardinal, La Marck in foot-note to Le Sage's Gil Blas. Jam portum inveni, Spes et Fortuna valete. Nil mihi vobiscum est, ludite nunc alios. Version of the Greek epigram in the Anthologia; reported in Hoyt's New Cyclopedia Of Practical Quotations (1922), p. 233. Translation by Merivale. Latin by Thomas More, in the Progymnasmata prefixed to first ed. of More's Epigrams. (1520). Avete multum, Spesque, Forsque; sum in vado. Qui pone sint illudite; haud mea interest. Version of the Greek epigram in Dr. Wellesley's Anthologia Polyglotta, p. 464. Ed. 1849; reported in Hoyt's New Cyclopedia Of Practical Quotations (1922), p. 233. Speme e Fortuna, addio; che' in porto entrai. Schernite gli altri; ch'io vi spregio omai. Version of the Greek epigram by Luigi Alamanni; reported in Hoyt's New Cyclopedia Of Practical Quotations (1922), p. 233. I walked abroad at noon,—and lo! Mary Pyper, Epitaph, A Life. Same on a tombstone in Massachusetts. See Newhaven Magazine (Dec., 1863); reported in Hoyt's New Cyclopedia Of Practical Quotations (1922), p. 233. And all the Errata will appear at th' end. Francis Quarles, Divine Fancies; reported in Hoyt's New Cyclopedia Of Practical Quotations (1922), p. 233. Our deeds, are characters of several sizes. The Levites are Correctors; Heaven Revises. We're gather'd, Sheet by Sheet, and bound for Heaven. Sum all perfection up, and she was—that. Francis Quarles, Epitaph on Lady Luchyn; reported in Hoyt's New Cyclopedia Of Practical Quotations (1922), p. 233. Robert Richardson, in his collection, Willow and Wattle, p. 35; reported in Hoyt's New Cyclopedia Of Practical Quotations (1922), p. 233. Richardson's lines on the tombstone of Susie Clemens as altered by Mark Twain; reported in Hoyt's New Cyclopedia Of Practical Quotations (1922), p. 233. Epitaph under an effigy of a priest. T. F. Ravenshaw's Antiente Epitaphes, p. 5. Weever's Funeral Monuments. Ed. 1631, p. 581. Pettigrew's Chronicles of the Tombs; reported in Hoyt's New Cyclopedia Of Practical Quotations (1922), p. 233.
quod negavi punior, quod servavi perdidi. On Tomb of John Killungworth (1412), in Pitson Church, Bucks, England; reported in Hoyt's New Cyclopedia Of Practical Quotations (1922), p. 233. That I kept till I went, that lost I. Translation of the Latin on the brasses of a priest at St. Albans, and on a brass as late as 1584 at St. Olave's, Hart Street, London; reported in Hoyt's New Cyclopedia Of Practical Quotations (1922), p. 233. It that I leif, I tyne. On very old stone in Scotland. Hackett's Epitaphs, Volume I, p. 32 (Ed. 1737); reported in Hoyt's New Cyclopedia Of Practical Quotations (1922), p. 233. I, Robin of Doncaster, and Margaret my feare. That I left, that I lost. Epitaph of Robert Byrkes, in Doncaster Church. Richard Gough, Sepulchral Monuments of Great Britain; reported in Hoyt's New Cyclopedia Of Practical Quotations (1922), p. 234. Epitaph in T. F. Ravenshaw's Antiente Epitaphes (1878), p. 158. Also in The Scotch Haggis. Edinburgh, 1822. For variation of same see Montgomery, Christian Poets, p. 58. 3rd ed. Note states it is by William Billyng, Five Wounds of Christ. From an old Manuscript in the possession of William Bateman, of Manchester. The epitaph to Archbishop of Canterbury, time of Edward III, is the same. See Weaver's Funeral Monuments (1631). Facsimile discovered in the chapel of the Guild of the Holy Cross, at Stratford. See Fisher's Illustrations of the Paintings, etc. (1802). Ed. by J. G. Nichols. Epitaph and citations reported in Hoyt's New Cyclopedia Of Practical Quotations (1922), p. 234. Soon, all shall be ours. Walter Scott, Unpublished Epigram, in Notes and Queries (May 21, 1853), p. 498; reported in Hoyt's New Cyclopedia Of Practical Quotations (1922), p. 234. Ne'er was able e'en to doze. Scarron, epitaph written by himself; reported in Hoyt's New Cyclopedia Of Practical Quotations (1922), p. 234. May the earth rest lightly on thee. Seneca, Epigram II. Ad Corsican. Martial—Epigram V. 35; IX. 30. 11. Epitaph on Shakespeare's Tombstone at Stratford-on-Avon (said to be chosen by him, but not original); reported in Hoyt's New Cyclopedia Of Practical Quotations (1922), p. 234. Percy Bysshe Shelley, Epitaph; reported in Hoyt's New Cyclopedia Of Practical Quotations (1922), p. 234. Tobias Smollett, Peregrine Pickle, Volume III, Chapter VII. Epitaph on Commodore Trunnion; reported in Hoyt's New Cyclopedia Of Practical Quotations (1922), p. 234.
Who then may do me justice. Southey. Written after Reading the Speech of Robert Emmet; reported in Hoyt's New Cyclopedia Of Practical Quotations (1922), p. 234. Epitaph at Staffordshire; reported in Hoyt's New Cyclopedia Of Practical Quotations (1922), p. 234. Here lies one who meant well, tried a little, failed much. Robert Louis Stevenson, Christmas Sermon; reported in Hoyt's New Cyclopedia Of Practical Quotations (1922), p. 234. Of generations beat the music down. Robert Louis Stevenson, Epitaph for himself; reported in Hoyt's New Cyclopedia Of Practical Quotations (1922), p. 234. Robert Louis Stevenson, poem written in 1879; probably original of his Requiem; reported in Hoyt's New Cyclopedia Of Practical Quotations (1922), p. 235. When Da'Capo the Trumpet shall sound. Epitaph to Samuel Taylor, in Youlgreaves Churchyard, Derbyshire, England; reported in Hoyt's New Cyclopedia Of Practical Quotations (1922), p. 235.
Who wert the voice of England in the East. Alfred Tennyson, Epitaph on Lord Stratford De Redcliffe; reported in Hoyt's New Cyclopedia Of Practical Quotations (1922), p. 235. A fairer spirit or more welcome shade. Thomas Tickell, Ode on the Death of Addison. Later placed on Addison's tomb in Henry the VII Chapel, Westminster; reported in Hoyt's New Cyclopedia Of Practical Quotations (1922), p. 235. And clap the Finis to my life's last page. And raise my form above the etherial skies. Revised, corrected, finally worked off! C. H. Timberley, ed. Songs of the Press (1845); reported in Hoyt's New Cyclopedia Of Practical Quotations (1922), p. 235. Mantua bore me; the people of Calabria carried me off; Parthenope (Naples) holds me now. I have sung of pastures, of fields, of chieftains. Virgil's Epitaph; said to be by himself; reported in Hoyt's New Cyclopedia Of Practical Quotations (1922), p. 235. Caused, through great cruelty to fall. Whom François Villon men did call. For God's sake say for him this Lay. François Villon, His own Epitaph; reported in Hoyt's New Cyclopedia Of Practical Quotations (1922), p. 235. Here lies the first author of this sentence; "The itch of disputation will prove the scab of the Church." Inquire his name elsewhere. Isaak Walton, Life of Wotton; reported in Hoyt's New Cyclopedia Of Practical Quotations (1922), p. 235. Samuel Wesley, Epigrams. On Butler's Monument in Westminster Abbey; reported in Hoyt's New Cyclopedia Of Practical Quotations (1922), p. 235. He departed this life "wound up"
And of being thoroughly "cleaned, repaired" and "set a-going"
C. H. Wilson, Polyanthea. Epitaph on a Watch-maker. Transcribed from Aberconway Churchyard; reported in Hoyt's New Cyclopedia Of Practical Quotations (1922), p. 235. In leaves and covers of eternity! Benjamin Woodbridge, Lines on John Cotton (1652); reported in Hoyt's New Cyclopedia Of Practical Quotations (1922), p. 235. Sir Henry Wotton, Upon the Death of Sir Albertus Morton's Wife; reported in Hoyt's New Cyclopedia Of Practical Quotations (1922), p. 235. If you would see his monument look around. Inscription on the tomb of Sir Christopher Wren in St. Paul's, London. Written by his son. Translation by Rogers, Italy, Florence; reported in Hoyt's New Cyclopedia Of Practical Quotations (1922), p. 235.